C. J. McCollum is an American professional basketball player who plays as a shooting guard for the Portland Trail Blazers of the NBA. During his third year in the league in 2015–16, he was named the NBA Most Improved Player. McCollum's elder brother, Errick McCollum is a professional basketball player for the Anadolu Efes of the Basketbol Süper Ligi in Turkey. He attended GlenOak High School in Canton, Ohio. He finished his High school career as the top scorer in the history of GlenOak. He was named Ohio Player of the Year for the 2008–09 season. McCollum attended Lehigh University, where he majored in Journalism. He was in history books again as he was the first freshman to be named conference player of the year in Patriot League and again won the same in his junior year. He also holds the record of being Patriot League's all-time leading scorer. In January 2013 he broke his left foot in a game against Virginia Commonwealth University, ending his final season at Lehigh. McCollum was drafted by the Portland Trail Blazers with the 10th pick in the 2013 NBA draft. He made his NBA debut against the Orlando Magic on January 8, 2014. McCollum won the NBA Most Improved Player Award for the 2015–16 season, highlight of which included eight 30-point games. The same season he and Damian Lillard became the first backcourt in the history of Portland to average 20 or more points apiece. 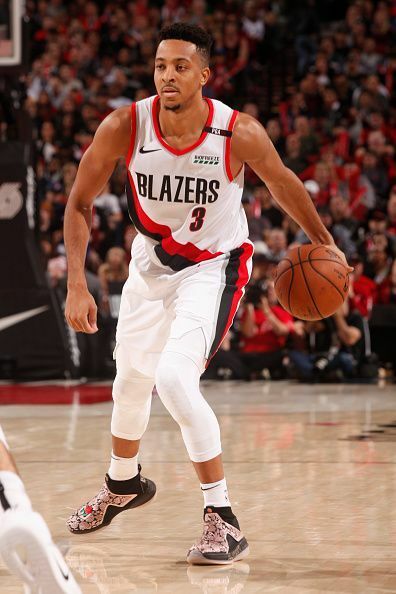 On July 27, 2016, McCollum signed a four-year contract extension with the Portland Trail Blazers. On December 10, 2016, he made a career-high 7 three-pointers in a loss against the Indiana Pacers. On April 16, 2017, McCollum scored a playoff career-high of 41 points in a loss against the Golden State Warriors in Game 1 of the first-round series. He scored his career high of 50 points on January 31, 2018, against the Chicago Bulls.